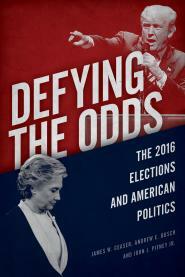 In Defying the Odds, we discuss state and congressional elections as well as the presidential race. The update -- just published --includes a chapter on the 2018 midterms. Last April, Wisconsin Democrats trounced Republicans in a statewide race for state Supreme Court, foreshadowing Dem wins seven months later in the Badger State (for governor and Senate). After last night, almost exactly a year later in another Wisconsin state Supreme Court race, Dem-backed Lisa Neubauer trails GOP-backed Brian Hagedorn by more than 5,000 votes, 601,007 to 595,206 – with the contest likely headed to a [recount].